The logic of operation of SSE technology can be seen in the picture illustrated below. 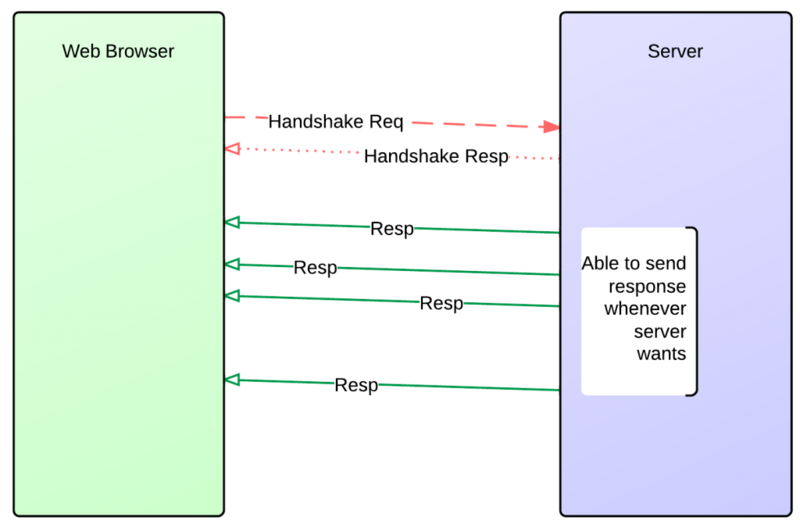 A handshake request is sent to SSE supported server by the web browser and server system returns a handshake response which is “text/event-stream” MIME type. After the handshake committed among web browser and SSE service, SSE service may send any amout of data at any time. JaxRS 2 standard under the technology umbrella of Java EE 7 provides support for SSE (Server Sent Events) technology with its second version. And now, let’s practice a Jax-RS 2 application together by using Twitter REST API which searches a word and then broadcasts the results to all clients in a certain interval. Dependencies Jax-RS 2 is under the Java EE 7 spesification and Jersey 2 library is the reference implementation of it. So, if the application is desired to be run in Glassfish 4 application server, in the following Maven dependency element must be added pom.xml that is Maven configuration file. SSE technology can be added to applications as an external feature of Jersey 2 library. It means that there is not any SSE feature in javaee-api (but glassfish contains inside), so it should be added as a provided dependency in the form of a plug-in/feature. We will use Json-P technology in the application which is a standard under the Java EE 7, for the purpose of managing the JSON objects and arrays easily. Because of that, “javax.json” dependency should be added inside the pom.xml. Because this application will make a Twitter search, it must use Twitter REST API version 1.1. for this reason (1.0 deprecated), you can benefit from Twitter4j library which elasticizes the usage of Twitter REST API. If the application is desired to be run in some lightweight Servlet Container platforms such as Jetty or Tomcat apart from application servers, “jersey-container-servlet” dependency can be added inside the pom.xml. A REST Endpoint class should be added inside the application for an entry point to Jax-RS server. If you pay attention to Application#getClasses() method, you can see that a Java class by the name of SearchResource is configured as a RESTful resource, and a new SseFeature is declared to RESTful application in the Application#getSingletons() method. A Java class namely SearchResource is a REST resource which enables the handshake between the web browser and server. In addition, SearchResource broadcasts the Twitter searches made on the server to the users. If data broadcasting is desired through the SSE technology with Jax-RS, a SseBroadcaster object must be created. If this SseBroadcaster object is added, every client that makes request to the server can make data broadcasting to all users through the SseBroadcaster#broadcast(..) method. SseBroadcaster class contains within itself each unique user along with EventOutput object. For example, an EventOutput object is being created when a user makes RESTful request to SearchResource#getMessages method. This EventOutput object remains as a broadcasting object which represents the current user’s session. If created EventOutput object attached to SseBroadcaster object then BROADCASTER can send any data to relevant user. When created EventOutput object sent to user, server sends a “text/event-stream” resource, so web browser starts to retrieve data from the server after it takes “text/event-stream” type Handshake data. SearchTwitTask is a task class which is type of Runnable interface and is being run in every 30 seconds with SchedulerExecutorService object. Of course EJB’s Timer Feature or Concurrent Utility version of (Managed)SchedulerExecutorService can be used here, but for portability reason, Java SE SchedulerExecutorService is used here. Firstly, Twitter records are being searched in which “Java EE” expression is mentioned and then the results are got as JsonArray object with Json-P library in the @Override Runnable#run method, respectively. Broadcast operations done with Jax-RS 2 can be forwarded to users as OutboundEvent object which will be created by the developer. In the SearchTwitTask class, String type twitJsonArray data which is identified as MIME type “application/json”is being broadcasted to all application consumers through the broadcast method of SseBroadcaster class. Pushes new data searhed for Java EE in every 30 seconds. You can Access to application’s codes from this address :https://github.com/rahmanusta/JaxRS-SSE.